Polarized Riflescope Filter fit the Mueller APV riflescopes. This polarized lens screws onto the objective lens of your riflescope and reduces the effects of glare, haze, reflections, and mirage. A target shooter can see sharper contrast and a clearer sight picture. A prairie dog shooter can aim with less mirage. A sniper can see more of what's hidden behind window reflections. The effect is very much like wearing polarized sunglasses... Everything gets clearer. 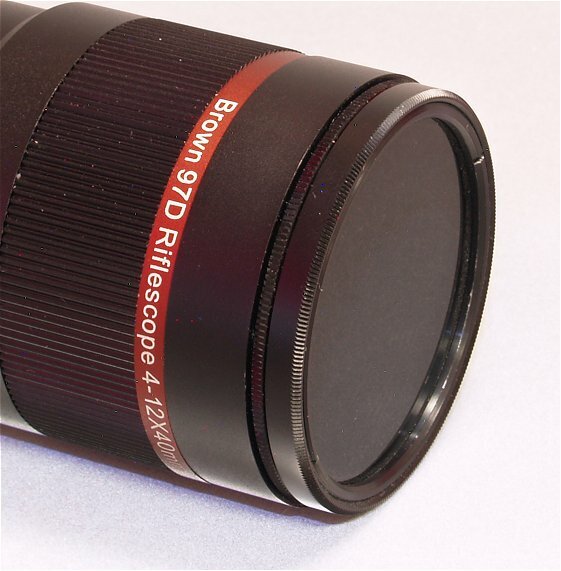 We don't recommend our polarized riflescope filters for low light shooting. But if you shoot with a riflescope during daylight, especially when the effects of glare, haze, reflec-tion, and mirage are present, a polarized riflescope filter is highly recommended. See all of our scopes, filters, and accessories at our Riflescopes Home Page.